This week I got into two middle-grade novels, both suggested by Anita Silvey on her website, Children’s Book-A-Day Almanac. 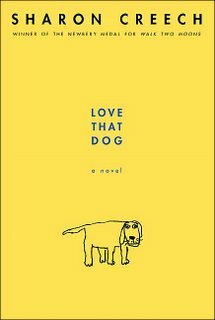 Love That Dog was a fantastic read, and quick enough that you can finish it before having to leave the library. But if you love animals, please listen and bring a box of tissues. I’m keeping my eye out for the sequel, Hate That Cat . 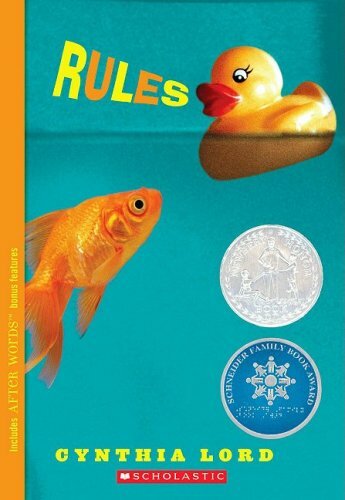 Another touching story was Rules by Cynthia Lord. This book followed Catherine, a twelve-year-old girl with an autistic little brother. Even without having dealt with a disabled sibling, I understood the character’s need to be normal, to not have people think things when they looked at her; to find acceptance and not have people realize how strange and different she really is. Rules also reminded me why I still love children’s literature: because actually, things don’t really change. Like when she’s trying to have a conversation with her new friend Kristi, and feels she can’t stop talking: “Soon as I say it, I wish I could stuff the words back into my mouth…Oh shut up, I tell my tongue.” I still don’t seem to have any control over how much I blather on, so I felt her pain. This week I’ll start reading One True Thing by Anna Quindlen for my MFA, and continue to pick away at A Game of Thrones. Maybe I’ll even start to chip away at the stack of books I already have. What have you read? And what’s in your pile? Hey. I remember reading “Where the Siewalk Ends” by Shel Silverstein(?) and the drawings were always so spooky and the poems were dark but it was children’s literature. I still love that work to this day. The Shel Silverstein book that weirded me out the most was The Giving Tree. But his poems are fun. Angels and gnomes together? That seems an odd mix.